As a youth pastor about 20 years ago, Rev. Dr. Marcenia Richards was used to helping young people in the safe space of the Pentecostal church. But when she decided one day to confront a group of kids shouting at one another and on the verge of fighting outside her home, she knew she was no longer in that safe space. Still, when she found out that some of the kids had dropped out of school, she promised them that if they went back, she would take them to Disney World. They took her up on it, and she fulfilled her promise by taking them on the trip. 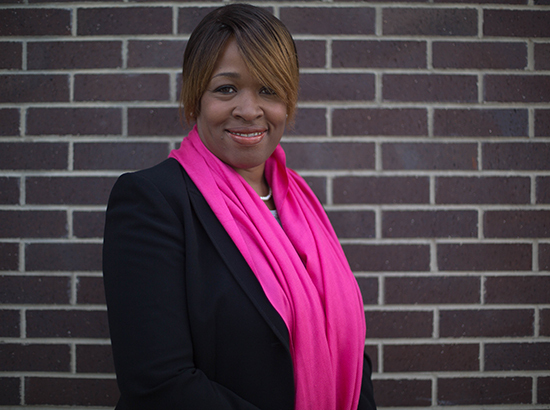 She has continued working to protect at-risk youth from violence, as a pastor and later as executive director of the Peace Coalition against Violence. A little more than a year ago, she founded and became executive director of Fierce Women of Faith, an interfaith organization that promotes peace in Chicago. Every Tuesday at 10 a.m., the women meet somewhere in the city to pray, wearing fuchsia scarves to make themselves visible in the community and signal their commitment to peace. They train women in advocacy, organize educational programs for kids and plan to work on changing gun laws. About 200 women have participated in the group’s activities, and Richards wants to recruit many more. They come from different faith traditions – Christian, Muslim, Jewish, Buddhist, Baha’i and more. On Oct. 26, the group will hold its first annual gala, Making a World of Difference, at which they will honor men and women working for peace in Chicago. The Reporter sat down with Richards to talk about her goals for Fierce Women of Faith, the power of interfaith work and the reasons she fights for peace every day. When you have Tuesday morning prayers, how do you incorporate all of the different faiths? It’s really, really beautiful. Sometimes we have various people lead the prayers, but at the same time, everyone’s free to pray in their own faith. When we were in Evanston, and we had some individuals from the synagogue there, we asked our Jewish sisters to lead the prayer. And then when we were on 69th and Ashland we had some of our Jewish, some of our Muslim and some of our Christian sisters together, with each leading a prayer. What are your goals for the group? Our primary goals are to recruit women to join the movement, see if they can help us go into the communities and advocate for peace, and to get other women to see how they can become a public witness. We’re hoping to deepen our partnership by going within the communities and finding out who’s already been doing this work, how long they’ve been doing it, how can we assist them. We’re not trying to become this group who wants to take over. We really want to partner with those who are already doing this work and see how we can lend a hand. Because as mothers, as sisters, as aunts, as surrogate mothers, as nieces – I think we can make a difference. Why is it important to have many different faiths working together? There is a cry in Chicago for peace, and together we can do it. Together we stand, divided we fall, and we’ve seen that. We can stay in our little corners or we can come out with a force that says we’re together. And we have one goal, one objective and that’s peace. There is more that can happen with unity than with division. Can you talk about a time you knew this work was important? I knew it was important when my 7-year-old niece said, “Auntie, you gotta do something about this violence.” Because she was afraid to come to my community. And then I knew it was important when I eulogized my neighbor’s son. And then I knew it was important when I went to a 14-year-old’s funeral, where another 14-year-old had killed her. Then I knew it was important when my house was shot, the window was shot out. I know that it’s important every day I pick up the newspaper and I see another shooting. And I want to do something drastic about it. Because this violence has become our Kryptonite, and it has to change. What is something surprising about you, and how does it fit in with the work you do? I’m from a family of 13. In addition to that, my mother raised, like, 21 foster children, so that’s surprising, right? Seeing my mom give her life to youth, including children outside of our family had a great impact on me. And seeing my dad, as a pastor, take on the role of father to so many people had a great impact on me.